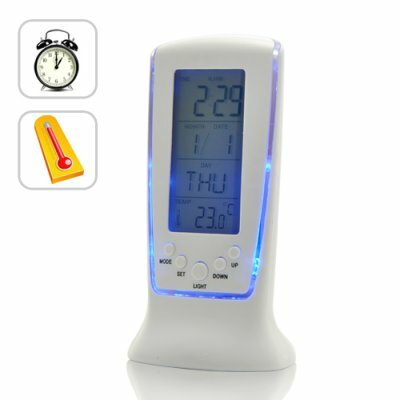 Successfully Added Digital Alarm Clock with Thermometer and Blue Backlight to your Shopping Cart. Stylish and affordable, the Digital Alarm Clock with Thermometer and Blue Backlight is a cool gadget that anyone can use. The compact and portable design lets you place it anywhere for use as a stylish ornament and cool clock. The Digital Alarm Clock with Thermometer and Blue Backlight is an affordable high-tech clock that will last for an extremely long time using only 3 AAA batteries. The LCD screen will display the month, date, day, and even has a built-in thermometer to show temperature (in both Celsius and Fahrenheit), and is just an all around useful device that makes for a great gift! What else does this amazing Digital Alarm Clock do? -Birthday Reminder: Set a time and date and this Digital Alarm Clock will automatically play the tune to Happy Birthday! How is this useful? Input your own birthday and give this Digital Alarm Clock to your significant other - no more excuses! -Sub-zero Blue Backlight: For use at night or just to look amazing! The blue LED lights up the edges of this Digital Alarm Clock to give it a stunning look, turning it from alarm clock to AWESOME alarm clock! This Digital Alarm Clock with Thermometer and Blue Backlight is brought to you at an affordable, factory-direct price and is in stock now for single or bulk quantity orders. Be sure to get yours now, because this hot product is sure to go fast! Brought to you by the leader in China wholesale electronics, Chinavasion. Mini music player - choose from 7 built-in tunes! Ideal for home, office, or as a great gift! Music player - choose from 7 different tunes! How can this Digital Alarm Clock possibly be so cheap?! Because we are awesome and offer to you, the equally awesome customer, everything at an awesomely low factory-direct price.